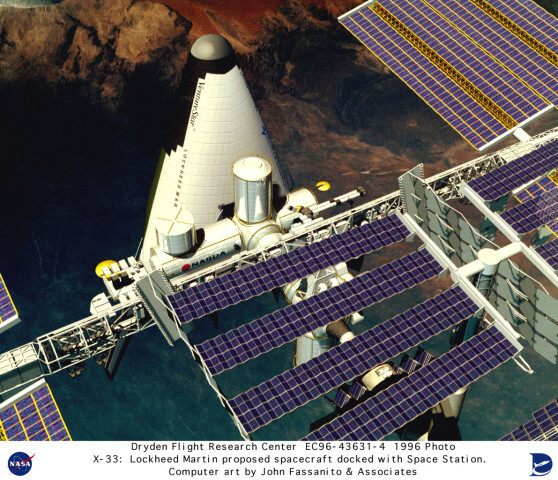 Description: This is an artist's conception of the proposed NASA/Lockheed Martin Single-Stage-To-Orbit (SSTO) Reusable Launch Vehicle (RLV) docking with the International Space Station. The X-33 was intended to be a technology demonstrator vehicle for this proposed RLV. The RLV technology program was established as a cooperative agreement between NASA and industry. The goal of the RLV technology program was to enable significant reductions in the cost of access to space, and to promote the creation and delivery of new space services and other activities that would improve U.S. economic competitiveness. Description: The X-33 was a wedged-shaped subscale technology demonstrator prototype of a potential future Reusable Launch Vehicle (RLV) that Lockheed Martin had dubbed the VentureStar. The company hoped to develop VentureStar early this century. Through demonstration flight and ground research, NASA's X-33 program was to have provided the information needed for industry representatives such as Lockheed Martin to decide whether to proceed with the development of a full-scale, commercial RLV program. The X-33 was to have been an unpiloted vehicle that would off vertically like a rocket and land horizontally like an airplane. It was designed to reach altitudes of up to 50 miles and high hypersonic speeds. The X-33 Program was managed by the Marshall Space Flight Center and will be launched at a special launch site on Edwards Air Force Base. The X-33 program was cancelled in February 2001, due to technical problems with the vehicle's composite liquid hydrogen tank.